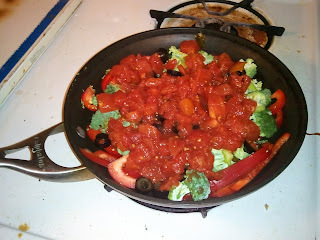 When I got home from work on a recent Wednesday, I took all the veggies out of my fridge and put them on the counter, with some other ingredients. Then I sighed frustratedly, threw my hands on my hips, and pouted louder and louder until my husband heard me and asked what was wrong. 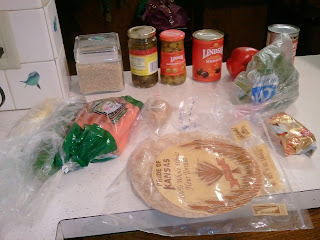 Except that these ingredients do not go together to make dinner! But they will. Yes, they will. 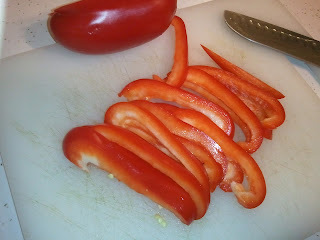 First I sliced up a red pepper. Honestly, I don't like green peppers. I won't pick them out of foods, but I never buy them. Red peppers are okay, though. There's no logic there. 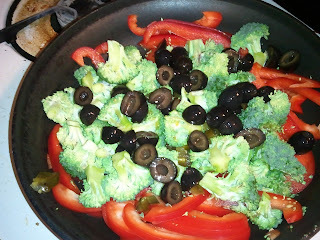 Next I chopped up some broccoli. Because what isn't good with broccoli? Maybe chocolate, but that's about it. 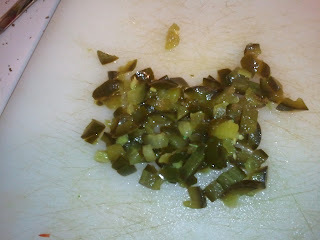 Normally I don't buy or cook with jalapenos, but I had some on hand for some Pioneer Woman recipe or other. 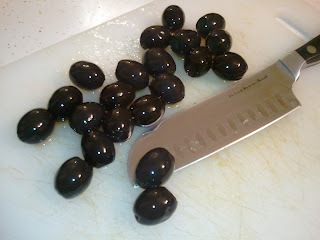 So I scooped some out, cut them up, and started getting a little nervous that this wasn't all going to work out. Rice! Rice would be good. 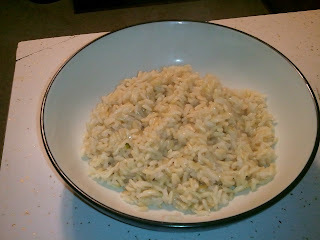 Normally I don't think of rice until too late, but I started it early this time. 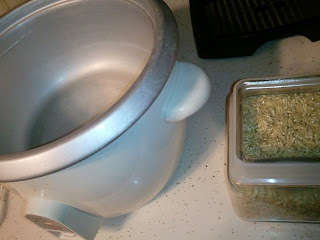 Put it in a rice cooker or pot with a 2-to-1 water ratio. 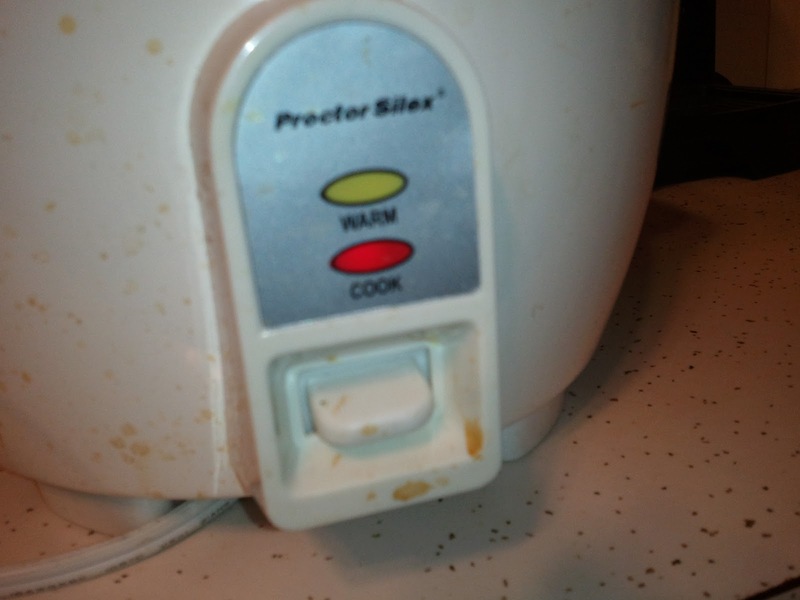 And don't forget to set it to "cook." I hate it when I forget that. For the record, I cleaned the outside of this disgusting thing right after this. Who knows why I didn't take a new photo then. Look, chopped jalapenos! 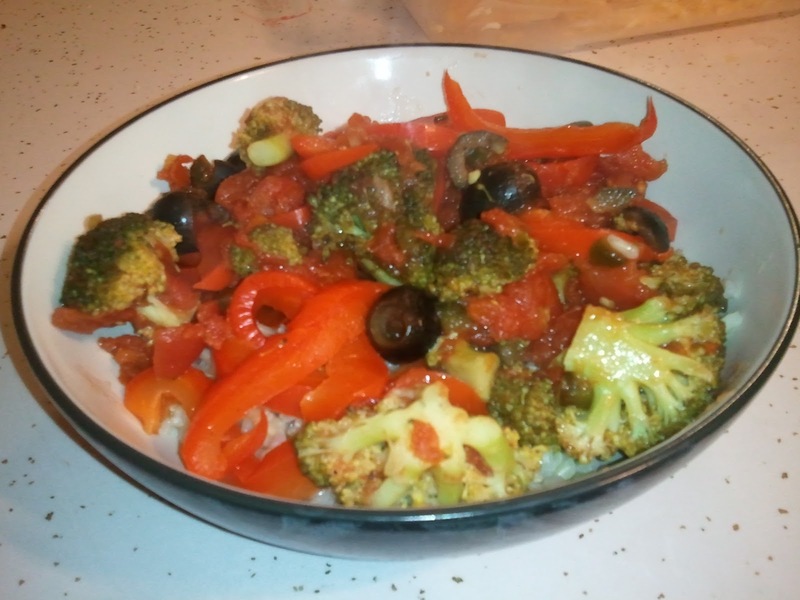 Truly, these jalapenos made this dish work. Otherwise it would have been a little blah. 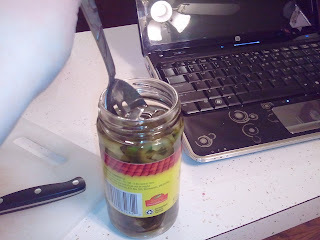 If you make this and don't have jalapenos, account for that with something else with a kick. And chopped black olives. Somewhere in here I decided that this would be Mexican-ish-themed. Now what? I was going to use taco seasoning but didn't feel like it. So... a can of diced tomatoes! Then I just let it all cook together on medium-high-ish while I cleaned up the kitchen and whatnot. This didn't look done enough to me, so I let it keep going on its own as long as there was still liquid to keep it from burning. If you're not comfortable doing that, just stand over it and sorta watch and poke it every once in a while. 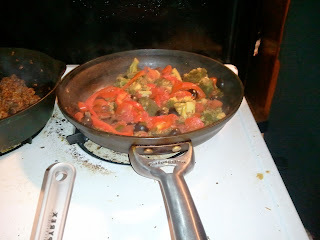 Looks like dinner to me! The rice finished up about the same time, so I put some in a bowl. 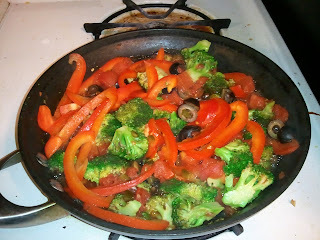 Then topped it with the mixture, which smelled surprisingly good. It was the middle of the week and I was friggin' exhausted, so I decided a glass of white zinfandel would complement it nicely. 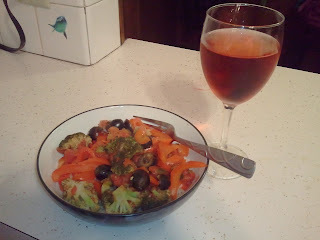 White zin goes with everything! It was a good decision. Cook the brown rice. 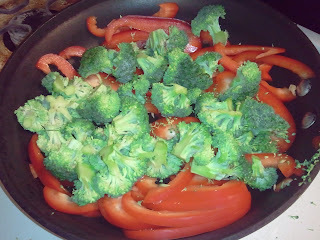 Chop the veggies and cook on the stove on medium-high until they're as done as you like them. Pile one on top of the other and eat. 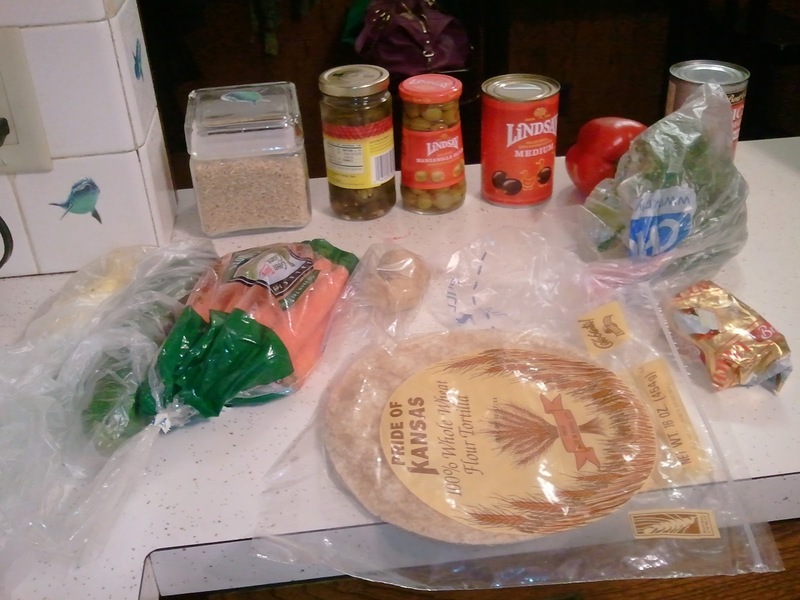 Soon I'll explain a little better how I make a meal out of random things when I'm starving and impatient (like I did above).